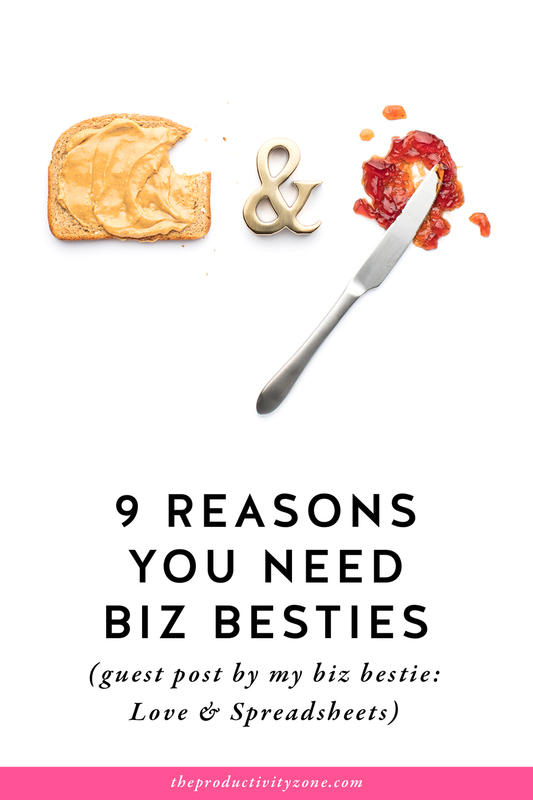 Business and besties go together like peanut butter and jelly!! #nobutreally. I had no idea just how AMAZING having a business bestie would be before Sarah of Love & Spreadsheets reached out to me. We’ve been business besties for almost 6 months now and I can’t imagine going through any of this business owning stuff without her by my side. Saying yes to her email was by far the best business decision I’ve made in 2018!! When I first started contemplating the idea of becoming self-employed, I always had one major fear: the lack of coworkers. Unlike a lot of creative entrepreneurs I know, I’m a major extrovert. The first time I took the Myers-Briggs test, I was 100% extroverted. That number has gone down to somewhere around 89% as I’ve gotten older, but the point is… I need to be around people. A lot. As you can imagine, while the idea of working for myself has always been incredibly appealing, the idea of working by myself? Not so much. I’m able to mitigate this in some ways by going to local meet-ups or working from coffee shops once or twice a week, but what I was really concerned about was missing the camaraderie — having other people who could help you brainstorm, give you feedback, encourage you, or just commiserate when you’re having one of those days. If this entrepreneurial thing was going to stick, I needed people who truly got it. I needed others who were in the thick of it just like I was, who understood the highs and lows of running your own business, who knew just how exciting it was to book your first client and how devastating it was to get a negative review. Whether you’re an extrovert like me or not, the reality is, you cannot do the creative entrepreneur thing on your own. No woman is an island, and in the same way we need support and encouragement for our non-career aspects in life, we definitely need support and encouragement in our jobs… especially when we’re in charge of the whole kit and kaboodle. You might think that you can do this so long as you have a support system in your non-business family and friends, and I absolutely agree that having a strong support system in that way is invaluable. But nothing can take the place of business besties. If you’ve been in business for a hot minute, you know there are few things more valuable than a person who can help you brainstorm. While we’re all perfectly capable of thought bubbling and writing out #allthethings in notebooks, talking things through with another person, asking their thoughts, and hearing another perspective can do incredible things for your business! Alexandra and I text back and forth constantly during our workdays and a lot of that time is spent brainstorming and asking for each other’s thoughts on various things. We’ve both launched new things in recent months and have some other things up our sleeves for the rest of 2018 that we’ve brainstormed together. My business has gone through some major changes in the first half of this year and I’m immensely grateful for all the thoughts and ideas Alexandra has shared with me as a lot of those transitions and changes have happened! That course you know would be a really great investment, but it’s expensive and you’re scared. That conference you want to go to, but you don’t feel like you measure up to the other attendees. We all have those things in our business that we want to do or invest in, but for one reason or another, we’re terrified and can’t quite pull the trigger ourselves. And this is where a business bestie is absolutely incredible. She can give you that often needed push to just go for it when you can’t quite get there on your own. On the flip side, we all have those things in our business that we want to buy or invest in or do… but we really shouldn’t. Maybe it’s launching a new product or service because you’re suffering from a major bout of Shiny Object Syndrome. Maybe it’s buying another course because you just know this is the one that’s gonna change your business… even though you have 12 other courses that were gonna change your business you have yet to finish. Just like we often need someone to talk us into things, we also need someone to talk us out of things. To remind us that our time and our resources are valuable and precious and we should think wisely before investing them. We all have those days — when you’re questioning why you started this business in the first place, when you feel like a complete failure, when you think no one’s going to buy your new service or product, when you’re ready to throw in the towel and go get a “real” job. In those moments, you need business besties to encourage you, to lift you up, to remind you of the value you give, of the incredible work you do, of the reason you started this whole entrepreneurial adventure in the first place. And the beauty of the business bestie relationship is you’re both going to have those days, which means you both get to lift each other up, remind each other that you’re valued and loved, and encourage each other to keep moving forward, no matter what. 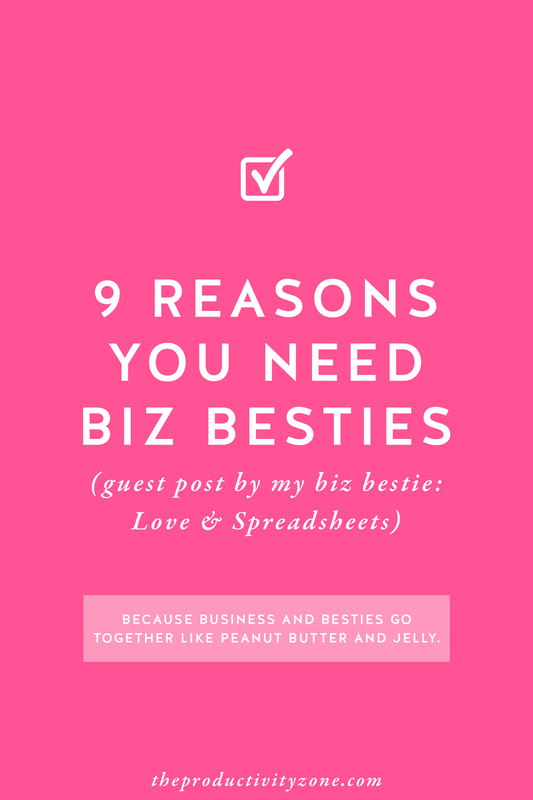 Whether you’re launching a new service or product, completely revamping your website, or just working on a blog post that was great in your head but sounds really weird on paper… sometimes you need a business bestie to review your work, to help catch things you missed, or share a perspective you just can’t have because you’re so caught in the thick of it that you can’t tell which way is up anymore. Alexandra’s been there when I rewrote my entire website in a weekend, when I needed a second pair of eyes to check over my pricing guides, and when I prepped to launch my email list. Similarly, I’ve read over her sales pages, blog posts, email drafts, and more. You know those moments when you’re so entrenched in something you’ve lost sight of the big picture? It’s in those moments you need business besties to give you honest feedback, whether it’s positive or negative. When you’ve poured your heart and soul into a new product or service offering, when you’ve spent hours slaving over a blog post that doesn’t sound right, or when you’re not sure if you should pivot your business… these are all situations where you sometimes need someone who knows you and knows your business but isn’t you and isn’t in your business to give you that honest, no-nonsense feedback that you can’t (or are too afraid) to give yourself. I think the only thing more exciting than coming up with a new product or offering is getting the opportunity to collaborate on a new product or offering with someone else in business you love and trust. Sure, working with someone else on something brings a whole host of issues you don’t have to worry about when you’re working on your own (coordinating schedules, anyone? ), but it can be such a delight to create something with another person who is just as excited about it as you are. FYI: Alexandra and I are working on a special collaboration and can’t wait to announce it so soon!! When your launch goes incredibly well. When you sell out your new offering. When you accomplish a major business goal. When you spend an entire weekend without checking your email. When you get to inbox zero for the third day in a row. Big or small, business-changing or not, we all need that person we’re able to text excited emojis and squealing gifs to when exciting things happen in our business. Yes, your non-business support systems will be there to celebrate with you also, but no one except a fellow boss lady is going to truly understand just how exciting it is when you accomplish something, big or small, that you’ve been working toward in your business. The internet is quite the juxtaposition — it connects us with people literally across the globe and yet can make us feel so very alone. In the online entrepreneur world, this happens far more than any of us probably want to admit. We watch other business owners succeed through square images on our phones or live videos and updates and we feel like we’re never going to get there. We start to question everything we’ve ever done in our business, whether or not we’re ever going to accomplish our goals, and why we started this whole thing in the first place. Ask pretty much any business owner ever and they’ll all tell you they’ve been there, too. And this is perhaps the most important reason to keep business besties by your side — to hear them say, “Me, too.” To hear them say they truly get it. To remind you that, no matter how much you may feel the opposite in that moment, you are not alone. Don’t worry, girl. I’ve got you covered. First things first: do not cold email people asking them to be your BFF, even if you’ve stalked them on every social media and internet platform available to mankind. You might know everything about them and be absolutely convinced you’re going to be the bestest of friends, but if they have no idea who you are, they’re probably not going to respond. Start by interacting with people in a casual, low-pressure way — think Facebook groups, Instagram comments, or Instagram Stories. But don’t do this with the sole goal of getting them to be your business bestie. Like with marketing, be genuine. Find people you admire and connect with for whatever reason and strike up a conversation on a regular basis. Get to a point where you’re both connecting with each other and when they see your name pop up, they know exactly who you are! This doesn’t mean that if you’re a photographer you can only be business besties with other photographers, or if you’re a designer you can only be business besties with other designers. Great things come from having besties who view things differently than you! When I say look for business owners with similarities, it can mean a lot of different things. It could mean they run the same kind of business you do, but it could also mean they have some super similar interests, they’re in a similar stage in business, they’re in a similar phase of life… the list is endless! Alexandra and I first connected years ago when she was running a wedding blog and I was running a stationery business, but we continued to follow each other and ultimately started our new businesses — with similar missions but different approaches — within just a few weeks of each other! Once you’ve found someone who would be a great business bestie, you’ve made those more casual connections, and you want to make things official, go ahead and send them an email! It doesn’t have to be formal or stringent or anything like that. In fact, it should be the exact opposite! Let them know you’ve really enjoyed connecting with them over the past few weeks or months, you love talking with them about X, Y, or Z, and you’re wondering if they’d like to take the connection a little further. Share a bit about your heart, why you’re looking for business besties, and what it would mean to you. Then pop the question! The worst they can do is say no and the best thing that can happen is you both wind up with an incredible business bestie! 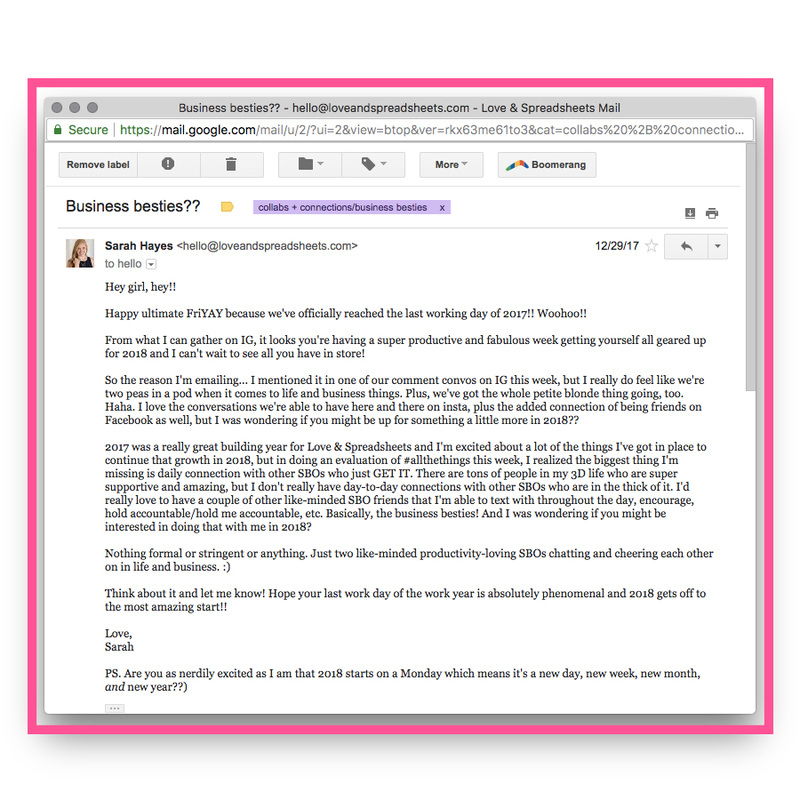 If you’re still a little unsure about what to say and needing some inspiration, here’s the exact email I sent to Alexandra when I reached out to her about becoming business besties! You’ve got the reasons, you’ve got the tips, you’ve even got the email template… so go out there, girl, and make some business besties! 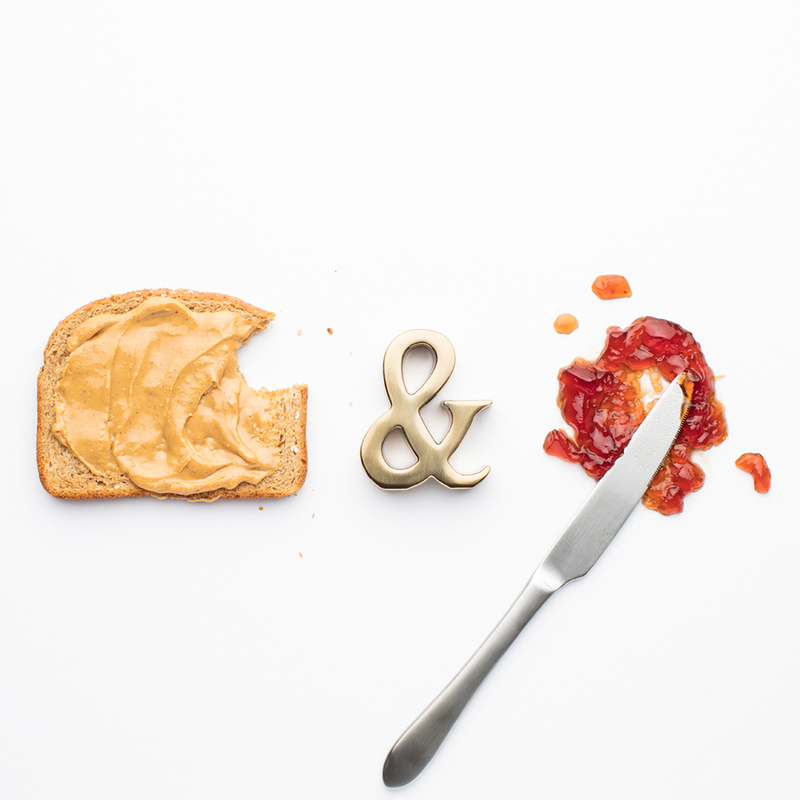 Sarah of Love & Spreadsheets is a creative business manager for right-brained business owners. If you’re in need of a right-hand woman for monthly support or someone to come in and help you overhaul your business systems, Sarah’s your girl!! 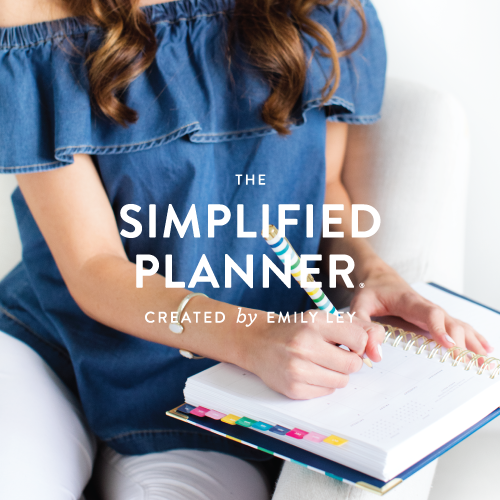 Check out her blog for amazing tips, follow her on Instagram for loads of inspiration, and receive her AMAZING content management Trello board templates when you sign up for her email list! !